Compared to the anniversary of Strauss – and last year Wagner, Verdi and Britten – the tercentenary of Gluck’s birth this year is really only just creeping into consciousness, well behind, it seems, that of C.P.E. Bach (Gluck only just makes this year’s Proms with an aria and a dance). But Theater Lübeck has leapt into the void with a rare production of his 1777 opera Armide. Daringly composed to the identical libretto that Lully had set with such success for the same Parisian public a century earlier, Armide was reputedly Gluck’s favourite among his operas. 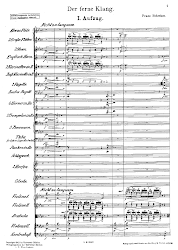 Wagner famously introduced it to the Dresden public in the 1840s, but it has rarely seen the exposure of the composer’s dramas from Classical mythology in the modern era. It’s a story that has often drawn composers, with further operas on the theme by such diverse figures as Rossini and Dvořák. Against the background of the crusades, the sorceress Armide bewitches her enemy, Renaud, to lure him from the battlefield, but finds herself falling for his charms herself. Rejecting the intervention of the personification of Hate, in an attempt to rid her of her crush, her magic is overcome, Renaud deserts her and she is left to regret her chance to kill him when she had the opportunity. I will admit to having difficulties with hearing words sung in French, reading surtitles in German and at the same time trying to convert either of them in the mind into English, but Michael Wallner’s staging didn’t, I feel, do enough to delineate this story and make it clear to his audience through his direction of the singers. Who, for instance, was the young girl, whose silent presence followed Armide around? After the encounter with Hate, she appeared to be a matching incarnation of Love, as the opera becomes a drama between these two states, but one was never sure. There were moments of levity, some inappropriate (often silly business involving Renaud’s fellow soldiers), some more illuminating (the portrayal of Hate as a cross between Batman’s Joker and a nightclub hostess). It was all striking to look at, with Heinz Hauser’s spiralling, primary coloured set visually turning the screw of fate and emotion. And Tanja Liebermann’s costumes were inventive, with for instance the soldiers’ uniforms referencing various styles from the medieval to the modern, and with the magic shield a disc of perspex and the sword a Jedi light sabre. 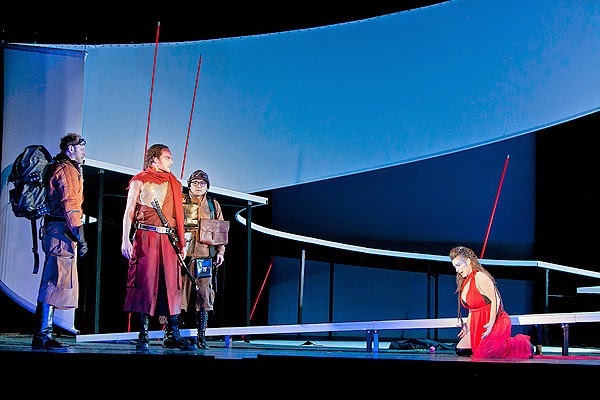 The production had been prepared and premiered under the baton of early-music specialist Christoph Spering, but this performance two months after the first night was in the capable hands of of music staff member Panagiotis Papadopoulos. Although he took 15 minutes longer than the advertised running time, which had presumably been based on Spering’s performances, there was no sense of dragging. Indeed, the music was driven often at an exciting pace and emphasised the powerful sense of drama Gluck is able to convey through his music. Guest principal Sabina Martin had a few pitch problems, but gave a compelling account of the title role and summoned plenty of rich tone for a tremendous final scene. Impressively, the rest of the characters were cast entirely from the company’s ensemble and chorus, led by an exceptional Renaud from young tenor Daniel Jenz, a charismatic performer with a lithe, immensely likeable voice. There were more than mere cameos from Gerard Quinn’s sinewy Hidraot and Wioletta Hebrowska’s seductively manipulative Hate and strong support from Steinunn Soffia Skjenstad and Evmorfia Metaxaki as Armide’s confidantes Phénice and Sidonie and also from Steffen Kubach (Ubalde) and Jonghoon You (Danish Knight). It should be noted that several of the singers were put through quite provocative vocal situations by the director, with Armide singing an aria while holding the weight of the child in her arms, Hate singing her pronouncements while suspended by wires several metres above the stage and Renaud and his fellow soldiers performing one number while running on the spot. Needless to say, all of them rose to the challenges, and their spirit seems to sum up the vibrancy and ambition of this plucky theatre and opera company.